The most important thing you need to win a Michigan driver’s license restoration appeal is real sobriety. You must have honestly quit drinking, and done so for good. The whole point of the license appeal process is to make sure that anyone who is even considered for re-licensure has genuinely stopped drinking, and has the commitment and tools to remain alcohol-free for life. In legal terms, this translates into 2 issues: That your alcohol problem is “under control,” and that it is “likely to remain under control.” Once you’ve proven that you have stopped drinking, the more important consideration is that you will remain a sober, non-drinker, from there on out. In this article, I want to talk about sobriety, and how really being sober is a lot different than just not drinking, or not being drunk. To win a license appeal, you have to show the Michigan Secretary of State, and its Administrative Hearing Section (AHS), the bureau that decides license restoration cases, that you are a safe bet to never drink again. When someone has lost his or her license for multiple DUI’s, the Secretary of State will never get mixed up with any notion that he or she can safely have a drink once in a while. If you’re ever going to win your license back, you have to prove that you and alcohol live in completely different worlds; different galaxies, really. This means that you must prove that you have gotten sober, and will remain sober. It’s not good enough to show that you have just stopped drinking. You must show that you’ve quit for good; that you have, as the saying goes, put the plug in the jug. For the reader unfamiliar with the process of getting sober, this may not make much sense. To anyone who has gone through it, however, you know that success in sobriety means always remembering that there is no safe way to ever take another drink. Someone recently made the rather profound observation to me that AA’s first step (“We admitted that we were powerless over alcohol – that our lives had become unmanageable”) is very easy to say, but that sobriety comes not from merely saying it, but rather accepting it, and that takes time and effort. This holds true for anyone who has quit drinking, even if he or she never has been and/or never will go to a single AA meeting. It is pretty universally accepted that once a person’s drinking crosses the line from being normal to being problematic, there is no turning back. In other words, you can never go back and take another drink. Those who remain sober accept this as fact; those who struggle with it find no peace. For as much as one could say about AA, and countless books have done just that, the primary point of the whole program is for people to stop drinking. Sure, if you’re in the program, you can probably talk endlessly about “turning it over” and things like that, but absolutely none of that matters if you haven’t “put the plug in the jug.” When a person in AA has a lapse, or relapse (clinically speaking, a “lapse” is a single episode of drinking, while a “relapse” is successive episodes), it’s not because he or she didn’t do a good enough 4th step inventory, or otherwise failed to continue to take inventory; it’s precisely because he or she failed to accept – and continue to accept – his or her power over alcohol. In other words, a person slips because he or she thinks that somehow, and for some reason, something has just turned magically different and it will be okay to have a drink. That, as we know, NEVER works out. Never. Never has, never will. 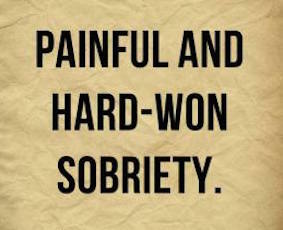 Sobriety accepts this fact and moves on. Struggling with sobriety means being stuck right here. The choice here means either drinking and slipping and reliving over and over all the problems that go with that, or getting on with an alcohol-free life and actually enjoying living again. This is also the point where we can rather easily separate those who are abstinent from alcohol from those who are genuinely sober. All sober people are abstinent, but not all abstinent people are sober. Abstinence simply means “not drinking.” A person stuck in jail for a year will be forced into abstinence. Sobriety requires abstinence, but takes it much further. Instead of just suffering through not drinking, sober people fundamentally accept that the risk of picking up a drink is too much. They see alcohol as the single common denominator of all the things that have gone wrong in their lives. Most of all, they build a life around not drinking. Without exception, you can stand back and watch the trajectory of each of their lives move up as they get on with the business of sobriety. Look, the reality is that it can be hard at first. No one finally quits drinking on Sunday and then finds everything to be just perfect by Tuesday. There is a process to getting sober. It takes work and effort. There is a sense of loss as one goes without friends, places and behaviors that have been part of life for some time. Even though, by the time most everyone quits drinking, the relationship to alcohol has become toxic, that doesn’t mean that the change to an alcohol-free life is effortless. Sure, drinking may not have been fun anymore, but at least it was familiar. Suddenly, that’s all gone. Just about everyone who gets sober meets sobriety like you meet a hurricane. But for those who are lucky enough, it lasts; it sticks. And make no mistake, it lasts because you make it last. In the long run, however, old drinking friends fall by the wayside. Better jobs are found, degrees are earned or finished, people lose weight, feel better, improve relationships with those who matter, and otherwise experience a wonderful improvement in their lives. This is sobriety. If you’ve gotten sober, then you know this. If you haven’t gotten there yet, then keep trying, but until you experience it, you can no more describe it than a man can describe the experience of giving birth. This is the basis for a successful driver’s license restoration appeal. I use the reality of my client’s experience with this and fit it into the framework of a successful case. This is exactly how and why I guarantee that if I take your case, you’re going to win your license back. If what I’ve described resonates with you – if you’ve lived through this – then I can get you back on the road. If you haven’t gotten to this point yet, please feel free to call my office to talk about things. We’re here to help.